Neil Fleming and Barbe and Swassing are both credited with this. It's one of the most common learning style theories and states that people predominately learn with one of the following: visual, audio, and kinesthetic. Fleming now uses VARK to describe his method with the R standing for Reading and Writing. Despite the fact that only 30% of students are auditory learners (60% are visual and 10% are kinesthetic), many teachers rely primarily on speaking in class, which means that a large portion of the students are left behind. The TPR (Total Physical Response) method is a response to allowing students to move around in class. Remember the VAK theory the next time you have a student that won't stop moving in class. If you'd like to learn more about VAK, check out these books. You might also be interested in . . .
Those are really useful stats. I thought it would be about 30% for each of them. I suppose it's all about finding out about your students at the start of the course and then catering for their needs. I always find that a bit tricky though. Do you do a needs analysis for each of your classes? I don't. I should! 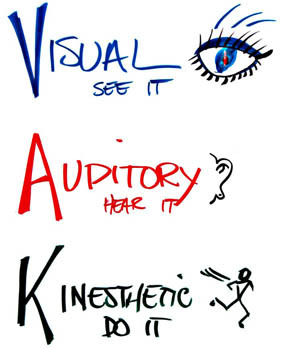 Kind of funny that most classes cater to listening, but visual is the top.